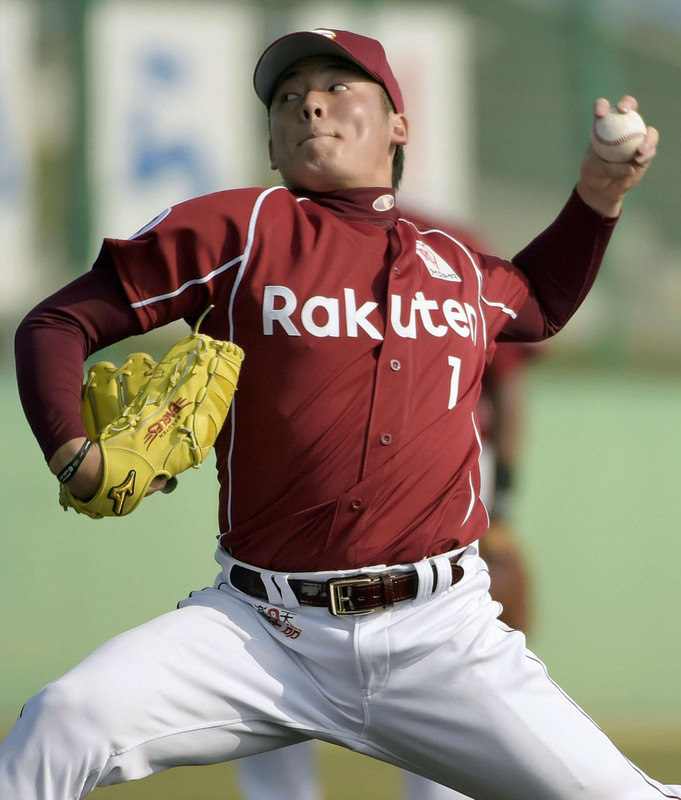 Earlier this year, 24-year-old Tohoku Rakuten Golden Eagles pitcher Wataru Karashima said he’d retire if he failed to reach 10 wins this season. Karashima has pitched in NPB for five seasons, and was used out of the bullpen over the first two, making 14 appearances as a reliever. Since becoming a starter in 2012, Karashima has won eight games twice, in 2012 and 2014, and three games in 2013. He’s a decent pitcher, not a particularly hard thrower but a player who will show flashes of good command and had a great showing for himself in the 2013 postseason. So a double-digit win season isn’t out of the question. Still, it’s probably for the best he laid his cards on the table in a tongue-in-cheek fashion. Karashima’s future career prospects notwithstanding, it’s important for the Tohoku Rakuten Golden Eagles that the left-hander have a good season in 2015. The same also holds true for 19-year-old left-hander Yuki Matsui. With Karashima, Matsui and 24-year-old Takahiro Norimoto, the Eagles might have three players under the age of 25 get the majority of the innings for incoming manager Hiromoto Okubo’s team, though the new skipper may draft Matsui into a relief role. Having that many young arms throwing a lot hasn’t exactly been a formula for success in the Pacific League as of late. Since 2003, only six teams have finished in the A-Class with three or more pitchers aged 25 or under (at the start of the season) logging more than 100 innings (the ’03 and ’05 Hawks won pennants), including last season’s Hokkaido Nippon Ham Fighters. The Eagles had four such pitchers last year and finished fifth. Assuming Norimoto maintains his current level — he was a 15-game winner and rookie of the year in 2013 and a 14-game winner last year — the onus is on Karashima and Matsui to improve because even if Norimoto is great, an ace can only take a team so far on his own, evidenced in 2008 when Hisashi Iwakuma was a 21-game winner for an Eagles team that finished fifth. The question is whether either or both, if Matsui is starting, can take the next step this season. Karashima and Matsui had somewhat similar seasons in 2014. Karashima was 8-13 with a 3.79 ERA in 154⅓ innings, and a 1.33 WHIP. Matsui was 4-8 over 27 appearances (17 starts) with a 3.80 ERA in 116 innings, and 1.36 WHIP. Opposing batters hit .273 against Karashima and .220 off Matsui. Where their numbers diverged more was in strikeouts and walks. Matsui struck out 126 last season and led the Eagles with a strikeout rate of 9.78. Karashima struck out 99 and finished with a 5.77 strikeout rate. But Matsui also issued 5.20 walks per nine innings compared to 2.68 for Karashima. With his ability to miss bats, simply finding a way to cut down on his walks would help propel Matsui, the darling of the 2013 draft, forward. We can further isolate what they did on the mound through their fielding independent pitching (FIP) averages, which measures only the factors a pitcher has control over. Karashima’s FIP was 3.70, while Matsui came in at 3.11. Karashima’s FIP wasn’t far off from his actual ERA, but the discrepancy between Matsui’s ERA and FIP (3.80 vs. 3.11) suggests he may have pitched slightly better than the summation of his outcomes showed in his ERA. Control was Matsui’s major problem last season. He walked too many batters and was far too erratic and hittable when he tried to rein in his pitches. He was a rookie, so a year’s worth of experience may have helped him iron out a number of issues, which could lead to fewer walks and perhaps a marked uptick in his performance in Year 2. Karashima has been around longer and has a 19-23 career record, with a 3.63 ERA and 1.28 career WHIP in 334⅓ innings, which isn’t vastly different from what he did last year. So barring a breakout campaign, the Eagles might already know what to expect. They’ll need him to at least avoid regressing in his sixth season, though it’s entirely possible Karashima pitches well enough for things to fall into place around him. Good, young pitching is one of the most valuable commodities in baseball. Youth in the rotation set the tone for the 2003 Fukuoka Daiei Hawks. It’s hard to see the Eagles reaching those heights — Daiei won the pennant and Japan Series with four pitchers 25 and under in 2003, and pieces of that core became cornerstones for four more first-place Hawks teams until 2011 — but Rakuten’s young arms can get the ship pointed in the right direction after a sixth-place finish last year. Norimoto is young and good, but it’s how Karashima and Matsui pan out that could make a big difference in Sendai.